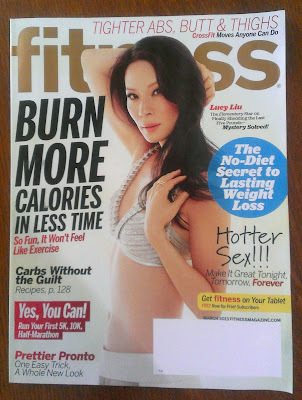 Diary of an Aspiring Loser: Intuitive Eating - in Fitness Magazine! 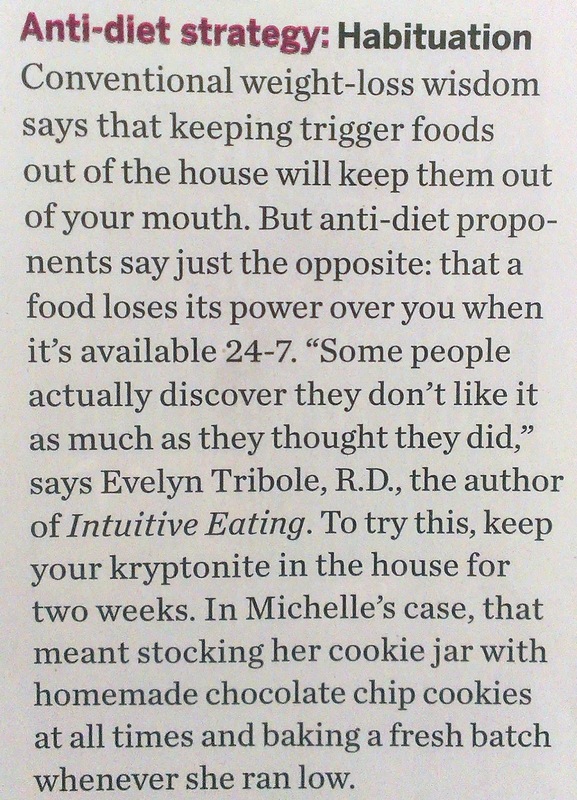 Intuitive Eating - in Fitness Magazine! 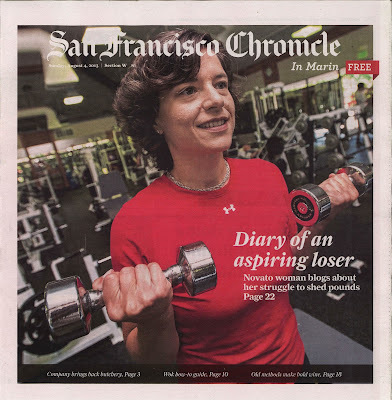 No, it's not a full-on profile all about me but it was an amazingly rewarding experience. 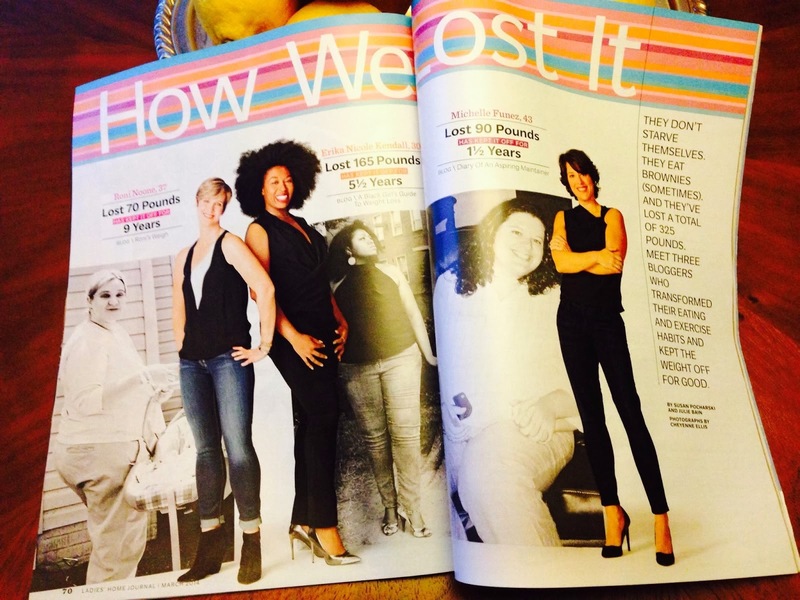 Here's how it happened, last year I was selected to be in a Fitness magazine article about food problems and potential solutions. 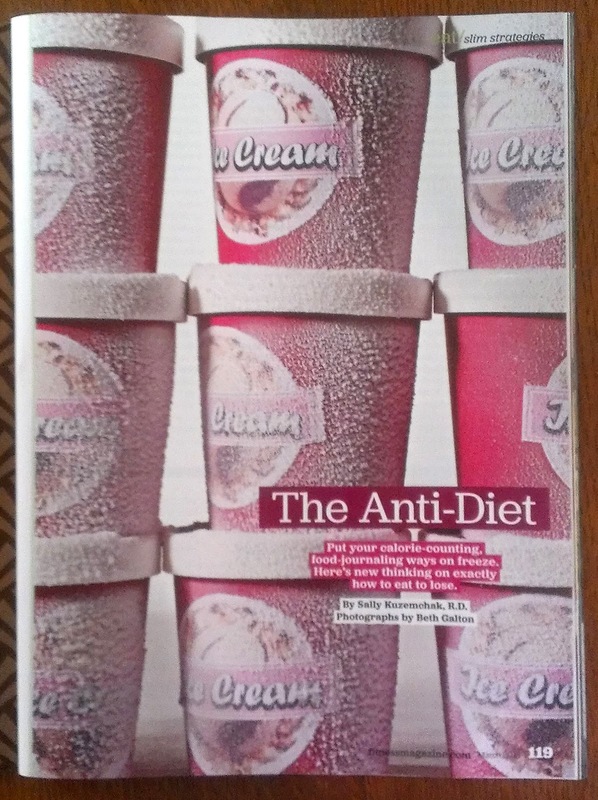 The article is called The Anti-Diet (my section of the article is here), and involves readers trying out several methods of "non-dieting" techniques to lose/maintain weight. Oh do I have a long list of trigger foods. Cookies, cake, ice cream, cheese, fried foods, sugary cereals, desserts of most any kind, chocolate, chips, etc, etc. When I was first told about the idea of habituation - in which you keep the 'trigger' food in your house 24/7 and give yourself unconditional permission to eat as much of it as you want - well, that idea made me very nervous. Here I am, less than 10 pounds from my goal weight, and I'm going to have trigger foods in the house with permission to eat it. Oh boy. I did a little research. I checked out Evelyn Tribole's website, the dietician I would be working with - who, by the way, wrote the book on Intuitive Eating - as well as the online intuitive eating community they've set up online. Lots of interesting talk going on over there, including lots of folks who have dropped Weight Watchers in favor of the IE path. So there are 10 "principles" to Intuitive Eating. 3. Make Peace with Food Call a truce, stop the food fight! Give yourself unconditional permission to eat. If you tell yourself that you can't or shouldn't have a particular food, it can lead to intense feelings of deprivation that build into uncontrollable cravings and, often, binging. When you finally “give-in” to your forbidden food, eating will be experienced with such intensity, it usually results in Last Supper overeating, and overwhelming guilt. 4. Challenge the Food Police Scream a loud "NO" to thoughts in your head that declare you're "good" for eating minimal calories or "bad" because you ate a piece of chocolate cake. The Food Police monitor the unreasonable rules that dieting has created . The police station is housed deep in your psyche, and its loud speaker shouts negative barbs, hopeless phrases, and guilt-provoking indictments. Chasing the Food Police away is a critical step in returning to Intuitive Eating. 5. Respect Your Fullness Listen for the body signals that tell you that you are no longer hungry. Observe the signs that show that you're comfortably full. Pause in the middle of a meal or food and ask yourself how the food tastes, and what is your current fullness level? 6. Discover the Satisfaction Factor The Japanese have the wisdom to promote pleasure as one of their goals of healthy living. In our fury to be thin and healthy, we often overlook one of the most basic gifts of existence--the pleasure and satisfaction that can be found in the eating experience. When you eat what you really want, in an environment that is inviting and conducive, the pleasure you derive will be a powerful force in helping you feel satisfied and content. By providing this experience for yourself, you will find that it takes much less food to decide you've had "enough". 7. Honor Your Feelings Without Using Food Find ways to comfort , nurture, distract, and resolve your issues without using food. Anxiety, loneliness, boredom, and anger are emotions we all experience throughout life. Each has its own trigger, and each has its own appeasement. Food won't fix any of these feelings. It may comfort for the short term, distract from the pain, or even numb you into a food hangover. But food won't solve the problem. If anything, eating for an emotional hunger will only make you feel worse in the long run. You'll ultimately have to deal with the source of the emotion, as well as the discomfort of overeating. 8. Respect Your Body Accept your genetic blueprint. Just as a person with a shoe size of eight would not expect to realistically squeeze into a size six, it is equally as futile (and uncomfortable) to have the same expectation with body size. But mostly, respect your body so you can feel better about who you are. It's hard to reject the diet mentality if you are unrealistic and overly critical about your body shape. 9. Exercise--Feel the Difference Forget militant exercise. Just get active and feel the difference. Shift your focus to how it feels to move your body, rather than the calorie burning effect of exercise. If you focus on how you feel from working out, such as energized, it can make the difference between rolling out of bed for a brisk morning walk or hitting the snooze alarm. If when you wake up, your only goal is to lose weight, it's usually not a motivating factor in that moment of time. 10. Honor Your Health/Gentle Nutrition Make food choices that honor your health and taste buds while making you feel well. Remember that you don't have to eat a perfect diet to be healthy. You will not suddenly get a nutrient deficiency or gain weight from one snack, one meal, or one day of eating. It's what you eat consistently over time that matters, progress not perfection is what counts. I feel like I could have written some of those principles. I not only agree with a lot of it, I've achieved many of those things. But who am I kidding? Doing this exercise could mean gaining weight. Ack! Worse, it could throw me off track. But wait, can it really? No, I don't think it can. I have enough trust in myself, in the person I am today, to know that won't happen. Right? So I thought seriously about whether or not I should do it. The truth is, I don't want to gain weight. When Evelyn emailed me, she stressed that I shouldn't pressure myself into doing this exercise, "it's not a good idea to push someone into this if you are not ready". That got me to thinking. Am I ready? Is this a good time? Maybe not. I certainly don't want to get off track. 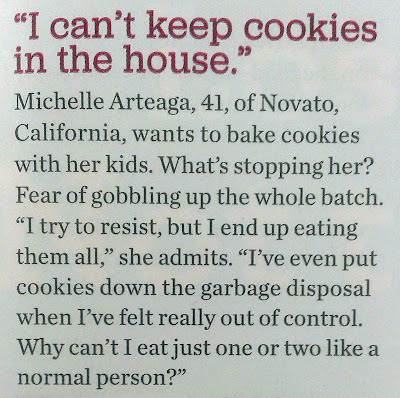 But I also don't want to go through life never baking cookies with my kids because I am scared of the friggin' cookies! Which is what I've been doing, by the way. So I started thinking about the idea of trigger foods. How will I react to cookies being in the house 24/7? How many will I eat if I can eat as many as I want? What does I want even mean? Will I go crazy eating cookies? And then I realized...I have trigger foods in the house right this moment. A week or so ago I bought one of those single serving Häagen-Dazs ice creams for Marek. He was asking for ice cream that day so I got it for him as a treat. And then he forgot about it so I never gave it to him. And it's been sitting in the freezer ever since, not calling to me. And another thing - tortilla chips. There's a HUGE bag of them left in the cupboard from the last time we had friends over for dinner. I haven't touched them. Haven't even wanted to touch them. So maybe I've changed some. Maybe my impression of myself, that of a person who has almost no self control around trigger foods - maybe that impression is outdated. Maybe I've grown and changed and not even realized it. Oh, and we've had m&m's in the house for the past couple of weeks for potty training and I've had maybe two. Without a battle. Ok fine, plain vanilla ice cream, m&m's and tortilla chips are not taunting me. But what about my lovely, warm, scentilicious chocolate chip cookies? You all know about my food meltdowns, when I totally lose control and am left feeling exasperated by my own behavior. But maybe this process will help me change the way I see those too. Maybe they aren't meltdowns, maybe they are ok. It's not like it happens everyday, or every week for that matter. 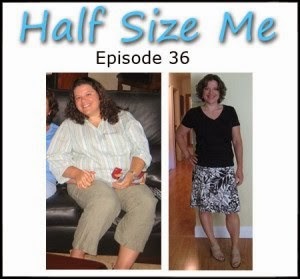 I thought about all the work I've done on changing the way I view my diet. My diet is mine, I am in charge. I make all the decisions and take ownership over them. No one - not Weight Watchers, not some arbitrary list of what's "good" or "bad", nothing - is telling me what to eat or what not to eat. I make choices. This is such an important point, I believe it's at the very core of my success. Four things that can lead, or contribute to, a binge. eat when I'm not crazy hungry, say about an hour after lunch. savor them, taste them, pay attention, look at them, smell them...and eat as many of them as I want. check in with myself before, during and after eating them. What do I expect? Am I scared? Nervous? How do they taste? How do they feel in my mouth? How are they affecting the way I feel? Were they satisfying? Was I disappointed? Basically, what are my thoughts, feelings and experiences, every step of the way. What is my true desire? It doesn't feel good to overeat. It doesn't feel good to undereat. Attunement: to bring into a harmonious or responsive relationship. This can't work without attunement. I asked about a few scenarios. What if it were after dinner and I started thinking about wanting to eat the cookies. Is it ok to talk myself out of them by thinking about what I really want as opposed to what I want right now? Yes. Is it ok to get rid of them if they are taking up too much of my mental energy? Yes. Is it ok to eat them? Yes! Just do so with awareness, with enjoyment, with permission. There're to be no "rules", no making bargains with myself, "If I eat this I'll have a chicken breast salad for lunch tomorrow to balance things out." No. Eat this now, see how it feels, see what happens. So, here's the plan. I will bake cookies with my kids on Sunday, two days from today. I stopped by the grocery store and bought a HUGE bag of chocolate chips. I can almost smell the cookies already. They are really, very, very good. I'm ready to give this a try. Wouldn't it be great if I could have this treat in my life in a peaceful, harmonious way? Toward the end of the conversation I told Evelyn that I am feeling quite curious to see how this will go. She said that was the perfect frame of mind, an open curiosity. Well, I'm open and I'm curious. so let's see what happens. Today is the big day. I had planned to bake the cookies with the kids but it didn't work out that way. Which is probably for the best. The idea is to eat the food as mindfully as possible, without distraction. The kids would definitely have been a distraction. I took the ingredients out and I'm waiting for them to come to room temperature. Ingredients for chocolate chip cookies. Yum! Ok, so I just realized I almost made a big tactical error. I had a big workout this morning (3 mile trail run followed by strength training) and all I've eaten since was a cup of Fage yogurt with a lite canned fruit and a banana. I am hungry. Practically meal hungry. 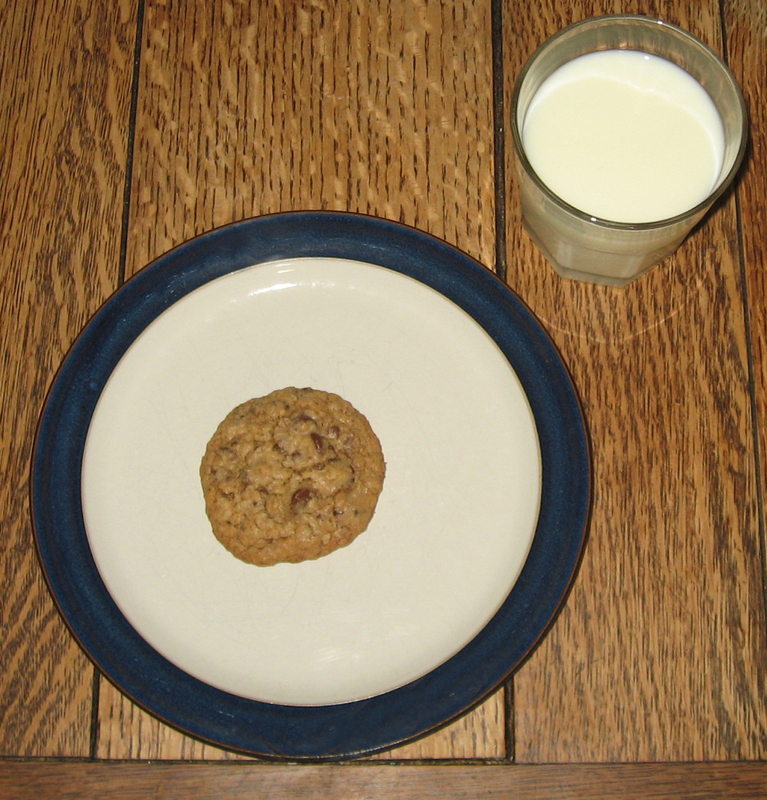 One of the things Evelyn suggested I not do is sit down to eat the cookies if I am meal hungry. If I am meal hungry and I make and eat these cookies, I might eat a meal's worth of cookies. And why wouldn't I? I'm hungry. When you're hungry for lunch do you eat cookies? No, you eat lunch. So, a moment ago I got up and started the Foreman to make a grilled cheese sandwich. I'll have that with fruit for lunch. By the time the cookies are ready it will probably be an hour since I ate, exactly what she suggested. Back to IE thoughts...I have been thinking a lot in the past 24 hours about this concept. And putting some of the ideas into practice. Last night I had Thai takout at a friend's house. I made an effort to pay attention to what I was eating, to ask myself a lot of questions about it. As it happens, I didn't actually like the fried spring roll. The flavors were just not to my liking, so I didn't finish it. In the past I might have finished based on the "I like fried spring rolls" belief (which is mostly true, by the way, but apparently not always true, there are bad spring rolls it turns out). Then, when I was putting the kids down for their naps a little while ago I thought something along the lines of, "wow, I feel really good today. I had a great workout, I'm feeling good about my body and what I've been eating, I really don't want to ruin that by overloading on cookies." Whoa, wait a minute. I don't have to overload on cookies as part of this. I may not want to. Let's be clear, I'm going to eat as many as I want to eat. I'm not going to stop because of the calories, or because of some idea of should not, but I'm open to the possibility that I will be satisfied with less than I expect. Bottom line, I need to try and remove expectations, in all directions, as much as possible. I just ate my really good grilled cheese sandwich (sandwich thin with 2 string cheeses) and grapes. May need to find something else to snack on while I make the cookies, feel a bit hungry still. Anyway, it's time. I'm off to make the cookies. Ok, the cookies are in the oven. I took notice of my thoughts and feelings while I was making them. I noticed that I had feelings of loving care, like I'd imagine some mom on a commercial might exude while she bakes a pie for her family. I also felt excited, oooh, these are going to be gooood, not-unlike Paula Deen when she's cooking (though I admit, I've always thought she was foolish to be excited about making "fattening" food when she was clearly at an unhealthy weight). But I was able to feel that excitement with very little judgment of myself (not quite sure if this would've been different back when I was significantly overweight, hard to say). I also thought that I might need to bake a second batch, they are so good, I might need more. So I left all the ingredients out just in case. Shhhh, judge-y voice in my head, there is no good or bad here. The cookies will be ready in 3 minutes. I'm going to put down the laptop now so writing doesn't distract me from enjoying these last few minutes of anticipation. Before: excited, nervous, thirsty (and drank some water), curious, they smell really good, they look good too but you can't tell by looking at them how good they taste. I started having a bit of panic about how many I'll eat and reminded myself, "there is no right or wrong". It took effort to keep that part of my brain - the food police - quiet. During: they look good, appetizing, I like the crunch when you first bite into them, but they are soft, warm and gooey inside, I like the sweetness, perfect...scared, they are too good...pecans. pecans would be nice to add the crunch of the nuts. When I went back for cookie #2 I thought about putting more than one cookie on my plate, I felt certain I'd want more than two. No, stick with the plan and don't project into the future. Eat the cookie you're eating now (reminds me of "run the mile you're in"). I ate the second cookie and then spent a moment considering if I truly wanted a third. In the end, I decided I did. The experience was really changing by cookie #3 though, even with the first bite I felt like the sweetness had gone down. I was starting to feel full. And then I felt that burn in the back of my throat when I eat too much sugar, I'm not a fan of that burn. About halfway through eating it I seriously considered stopping. But decided I wanted to finish it because, don't get me wrong, I was still enjoying it (I think). When I was done I felt clearly full. But I still walked over and looked at the rest of the cookies; I wanted to be certain I didn't want another one. Lord knows being full hasn't always stopped me from eating. Nope, I definitely don't want another. After: Enough. I have had enough. And that thought made me teary. Why? I can't say right now, I don't know. And I'm not going to start analyzing it. I just like it. They were good. They met my expectations. I have a slightly uncomfortable feeling of fullness right now. Next time I eat them, I want to remember this part so that I'm comfortable when I'm done. I don't want any negative feelings associated with my beautiful cookies (don't laugh). There are 20 chocolate chip cookies on my kitchen counter right now - and I don't want to eat one of them. I think in the past I would have rushed through eating them, and not truly enjoyed them the way I did today. I would have had to keep eating them to have the experience of tasting them. But with the way I ate them today, I know what they taste like, what the feeling of eating them is. 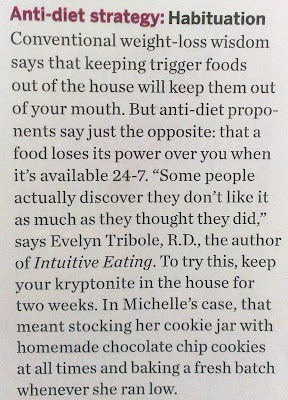 During my talk with Evelyn on Friday I told her I would probably eat 4 - 5 cookies. She reminded me to be open, to try and be free of expectation. And it turns out I was wrong. I ate 3 cookies. And with that, my first experience with the homemade chocolate chip cookies is over. After they cool completely I'll put them away. My daycare provider called earlier and I told her I was baking them. She oooh'd (I've given her some in the past). I think I'll take her 2-3 in the morning. And I will share them solely from my heart instead of out of a need/fear to get them out of my house. How will things go from here? I don't know. I will keep these cookies in the house all week. I talk to Evelyn again on Friday. I might have more after dinner tonight, though right now that doesn't sound very appetizing, who knows how I'll feel later. I am giving myself full permission to eat them at will. Also, to that end, I am not tracking them. If I track them I feel like I will get into some "should" thinking around them and I want to keep this process as pure as possible. I will eat normally the rest of the week and try not to compensate for the cookies by cutting back. Cookieeeees! I feel a bit like the cookie monster as I start this entry. Things have been interesting with the cookies. On Sunday evening I had dinner in The City with a friend. We went to Indian food. I'd planned to take a couple cookies with me so we could have them for desert but I forgot. When I got home around 11:30 I had one. I tried to be mindful and present when I ate it, though being tired and it being late, it wasn't easy. And I didn't take any notes. I remember feeling like I couldn't really taste the cookie like I could earlier that day. Part of it was eating a cooled cookie, as opposed to one fresh out of the oven. The other part was probably that I was pretty full. Earlier at dinner I'd actually stopped eating before I finished my meal due to feeling full. 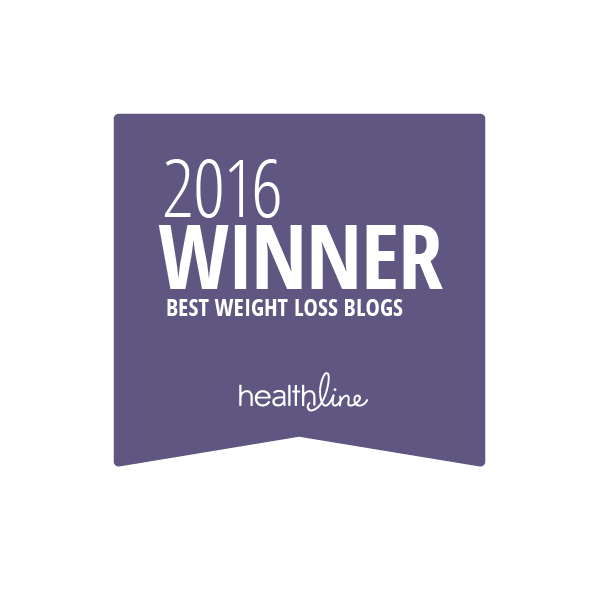 I think that was at least partially a result of this Intuitive Eating exercise. In general I am becoming less and less comfortable with feeling uncomfortably full. That may sound obvious but if you're a food junkie like me, I think you know what I mean. And IE has got me thinking and noticing a bit more where my fullness level is. Anyway, I had a cookie and went to bed. Yesterday, Monday, I didn't have a cookie all day. I considered taking some with me to work, mostly so I would have them available 24/7 as is the idea, but I really didn't have the desire so I followed that and left them at home. When I came home from work and saw them on the counter I considered eating one. Then I remembered that I was meal-hungry, not snack-hungry, and that I need to eat dinner first. I knew I'd have one after dinner in any case. After dinner we all had one. It was really fun enjoying this treat with the kids in a carefree sort of way. Marek was very excited about his cookie and Myra actually gave hers a hug and kiss, which was downright adorable, if not a little scary. Neither of them asked for another cookie, which I also thought was interesting. I had some errands to run after dinner so I took Marek and we hit the road. At Target I was feeling like chocolate so I purchased a York Peppermint Patty. I ate it when I got home as I was unpacking the groceries and other stuff. I made a point to be mindful about it, tasting every bite, noting how I felt. Today I know I have a better memory of eating it than I would have otherwise. After the kids were in bed I thought about the cookies. I decided to have one. It was ok. Again, not being warm, it just wasn't the same. A little while later I decided to have another one but this time I popped it in the microwave for 10 seconds. That helped. I thought about having another one. I was watching a TV show and didn't feel a big urge to get up and get one so I let the thought sort of come and go. What was very interesting was that the thought did just that, it would come and go. I didn't feel possessed by it, which was nice. I felt like I was deciding whether or not to have a peach, or another cheese slice - it just didn't have the same power that it's had in the past. Sort of an, eh, we'll see sort of feeling. In the end I decided to have one. Was I honoring my health by eating these cookies? Not so much. 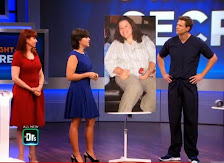 But I felt that the experience to be gained from this experiment, of eating as much as I want and sort of disregarding other voices telling me to stop, is worth any negative effect on my health. Besides, as stated above, nutrient deficiency isn't exactly a concern here. 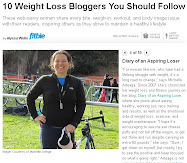 Though what is a concern, and one that I am not yet able or willing to ignore, is weight gain. I got on the scale this morning and it was quite a bit up - something in the 156/157 range. I hopped off quickly. Is it TTOTM? That seems like a big jump. In any case, I'm trying not to let that impact my IE exercise. I feel like I'm making real progress with these cookies, I do feel like I'm truly changing the way I see them. And that's worth weight gain. This is all about lifetime, sustainable change, right? I'm not in it for what happens to my weight today, or this week, or even this month - I'm in it for life. Don't get me wrong, I want to be at my goal weight tomorrow. Things haven't changed that much around here. But I'm just focusing on being ok with where I'm at today. As far as today is concerned, I didn't feel the desire to bring any cookies to work. In fact, I don't even think they crossed my mind this morning. I'll be interested to observe what happens tonight. That's all I have on the cookie front. Is anyone really going to read all this? Ha! Alas, the cookies are gone. Today is my day home with the kids and we all went to the beach. I ate the last cookie when we got home. The way I ate it is a disappointment. Instead of really enjoying it, I ate it while I was unpacking the beach gear from the car. It being the last cookie means the batch of 23 cookies lasted 4 days. I gave 6 away so that means my family and I ate 17 cookies in 4 days. I ate, what is it, 10, of those cookies? Somewhere around there. 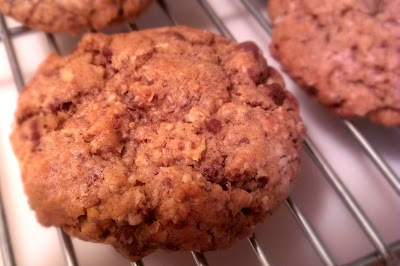 The cookies being gone means I need to make another batch. Kids are sleeping so when they are up I'll get the mixer going. I'm excited to make them with the kids. That is, after all, one of the big reasons I wanted to do this exercise. The scale is up. Kind of in a big way - like 3 or 4 pounds. I can't imagine it's all about the cookies, I didn't eat that many, did I? I'm trying to not let it get to me and just go with the experience. One thing I've noticed is that giving myself permission to eat the cookies is "leaking" into giving myself permission to eat other things too. It's fun to just eat whatever I want. Duh. But that's not what IE is, there are principles, and I need to keep in mind I'm not really following the IE principles in whole, I'm just picking out this habituation piece. That means no more crackers and peanut butter Michelle! I'm 4 (WW) points over for the week, and that does NOT include the cookies, since I'm not tracking those. So I guess it's no mystery why my weight is up. I'm very curious to see how this second batch of cookies will go. The original idea was to do this habituation thing for two weeks. Today is only Day 4. Ten more days seems like a lot. Especially since I'll probably get tired of baking cookies. I wonder though, if I have these cookies sitting on the counter for another week and a half, I wonder if they will not be so tempting? Truth is, they are already not as tempting as they used to be, it's just that giving myself 100% permission to eat them means even a little bit tempting leads to eating them. Cookies, cookies, cookies. Are you getting as tired of this topic as I am? It's working! Sort of. I am still eating quite a lot of cookies. And I've gained something like 3 pounds this week, though I can't imagine that's all cookies. But the big news is - the allure of the cookies has faded significantly. I have noticed that excitement is mostly gone. Don't get me wrong, I still want to eat them, which is what I've been doing, but I think I'm eating them mostly because I can and because they're good - as opposed to eating them out of compulsion. Is that a clear distinction? So a compulsion is something we do to release anxiety or tension. Before, when I had these cookies in the house I'd feel this tension, "Should I eat them? I shouldn't eat them. I want one. But I shouldn't...". To release the tension, I'd eat the cookies. And it would alleviate...for a while. Sometimes 5 minutes, sometimes 5 hours. I can't say for sure - because I've been eating them whenever I want - but I feel like something has shifted and that I won't have the same response to the cookies moving forward. At least not 100% of the time. Catch me at the end of a hard day and maybe I will, but even then I still believe something has changed in my perception of the cookies. I ran out of cookies and had to bake more on Wednesday evening. Turns out the kids weren't so interested in making them, mostly they were interested in eating them. But I baked more and ended up eating quite a few freshly baked cookies. They are SO good when they're still warm. Even the experience of baking them was noticeably different than the first time around. I didn't feel that excitement that I'd felt, that building enthusiasm, "cookies are coming, cookies are coming!!". It felt more...I guess normal is the right word. Wow. I think this exercise means my kids will grow up with my chocolate chip cookies. 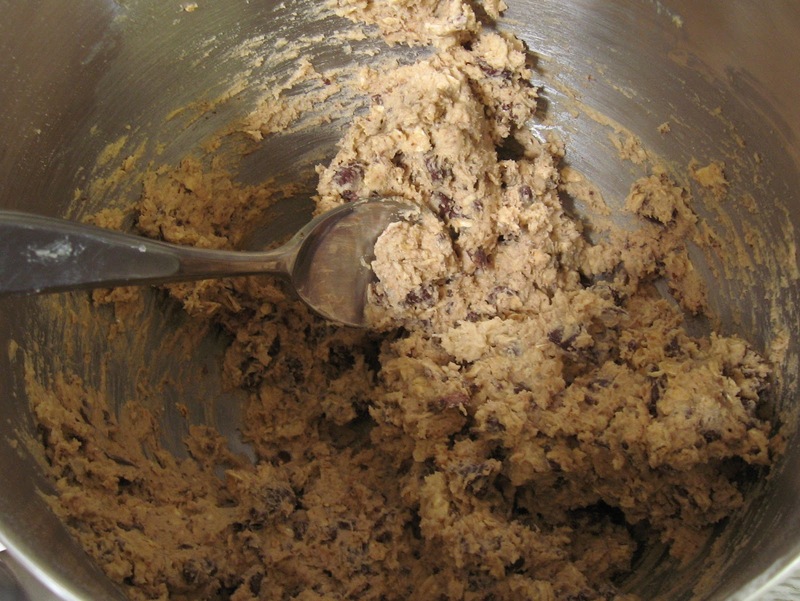 I may not make good lasagna, but I can make a mean batch of chocolate chip cookies. And that's nothing to be afraid of. I hope this doesn't come across as, "I'm cured! ", because I'm not. If anything, this exercise has convinced me even further that I'm a bona fide food junkie and that no amount of habituation, at least on its own, is going to stop me from eating too many cookies. 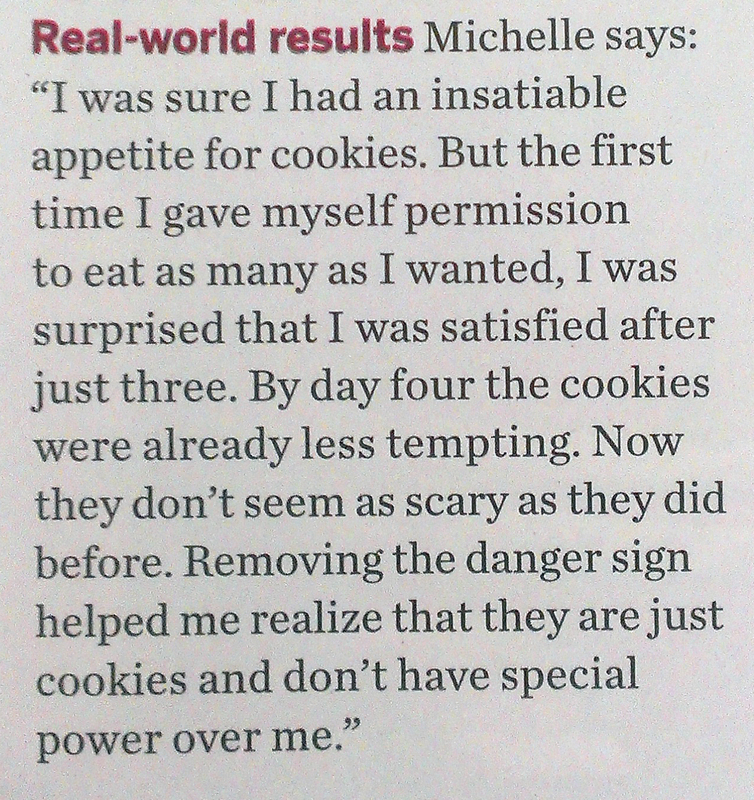 But the tension that leads to me eating cookies that I don't really want to eat, that's what may be different. All that to say that I have a new plan for this coming week. When I started I had the plan to have these cookies in the house 24/7 for two weeks with full permission to eat as many of them as I want. Today is Day 6, that means eight days to go. But today is the first day of my WW week. So I plan to continue to have the cookies in the house for the coming week but I'm going to make a change. Instead of eating them at will and not tracking them, I'm going to continue to eat them but track them. They are 4 points each, which means I could eat one a day if I want. And I may do that, who knows? I feel like the experience of having them in the house will be very different than if I hadn't done this exercise. I hope that's true. In any case, trust assured, I will tell you all about it. Today is my final phone session with Evelyn. I feel so lucky to have had a chance to work with her. 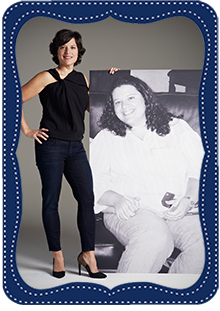 She's the master of intuitive eating and her energy around the topic is infectious and exciting. I'm definitely going to get the book and read it, and I know I'll be wiser for it. But like everything else, I'll take what works for me and leave what doesn't. For a couple different reasons I had a weight gain this week, 3 pounds. I know I often think I'm going to see a weight gain and then I don't, but this week I did. I'm doing a little food experiment and that's mostly the explanation for the gain, that and the side effects of the experiment. I'll have to go into that more at a later time, it's not quite ready for print. Maybe the gain impacted my enthusiasm for the experiment so I stopped writing about it. I can't remember that far back. The 3 pound gain was practically wiped out the following week. Had it it all been due to the cookies? I find that doubtful. Anyway, doesn't matter. So I've been thinking lately about that conversation we had in the gym locker room about being able to one day have a "normal" relationship with food. I said it can't be done. You were working with your therapist on trying to get there. I was very knowitall in my belief that, "nope, can't be done." And I just wanted to say I was wrong. It can be done. Hopefully one day I'll get there, not sure, but I don't like having my mind keep the door closed on something as *big* as that. What was I thinking? I know what I was thinking, I was thinking it is too big, too much. Just wanted to send you this message to apologize for being the negative nelly. In the span of a few months my belief of a possible normal relationship with food changed. Around the same time I stopped tracking Points. It wasn't a conscious decision I made one day, I just slowly stopped doing it and after some push-pull trying to force myself, I realized I was doing fine without it. I've talked to several people who feel that they will need to track for the rest of their lives, that it's the only way for them to control their eating. 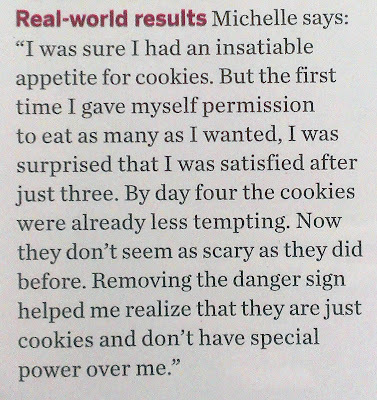 Maybe that's true for some people, but I suspect that with some work, with some psychological excavation and re-construction, maybe they too could find they can control their eating without tracking. Or maybe the idea is about a bigger paradigm shift, that we need to stop thinking of it as something we need to control altogether, but rather as something we need to move into harmony with. Something tells me if I were talking to Evelyn right now she'd give me a hearty, "Exactly!". These insights are coming at such the perfect time. Re-reading my IE journal has helped to straighten out my head a little. This pneumonia thing triggered my anxiety, triggered fears of being out of control. This post is reminding me that I don't have to fight that battle, that I need to trust in the growth I've made up to this point, and that I, and my body, will be ok through this. Cool! I just checked out your blog, interesting stuff. I especially liked the IE holiday eating bill of rights, I'd never seen that before. Are you still at peace with the ice cream? I don't think I am ready to do this. I have read about IE and think it's a great concept. The only problem is I am a food addict. Seriously. 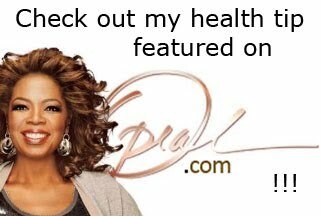 My blog is all about it. Maybe one day I'll be ready. As soon as I started reading this entry I went over to the counter and realized I had that very magazine already! I just hadn't finished reading it yet. Cool! Lucy has a black outfit on the cover of mine though. It is a really interesting concept. Good job with your cookie experiment! I actually have been unintentionally going that route for the past few weeks. I realized a couple months ago I am not addicted to food and I stopped letting it have so much power over me. I have been focusing on eating good things but paying attention to whether I am hungry when I eat or not. I let myself eat "normal" foods (hamburgers, fries, chocolate, etc.) in moderation but my biggest thing is paying attention to portion sizes...that is where I have problems. Once I stopped a lot of my emotional eating I realized that I wasn't eating as much and I wasn't eating as much junk. I also have been paying more attention to what is in my food and trying to eat cleaner. That has made a huge difference. I stopped tracking my calories for the last couple weeks...I figured it couldn't make me plateau more than I already was. I eat pretty much the same healthy-ish things as before (I'm not doing a free for all or anything) but now I'm not stressing about food like I was and it actually feels kind of nice not to focus on food. I'm sure I will go back to tracking at some point but my little experiment has taught me a lot. "I realized a couple months ago I am not addicted to food and I stopped letting it have so much power over me." - what a huge insight! volume is a tricky thing, it's hard to honor your hunger when you're appetite is out of whack because of years of overeating. I found it took quite a while for my appetite to settle into what I now consider more normal. Carry on Jamie, you're doing great!! Thanks, glad you're enjoying it. I wasn't joking when I said it was long! Wow... this is exactly what I've been trying to do myself, but I didn't know it was an actual technique or "thing" that existed. I'm a long-time food addict and I've been trying to get myself away from the whole "dieting" mentality and into a lifestyle of just eating well intuitively, in this same way. I don't know why reading this made me teary eyed... maybe it's a relief to know I'm doing something right and not being weird, LOL. Thank you so much for sharing this... I'm going to look into Evelyn Tribole's books and keep working on this, now much more confidently!! 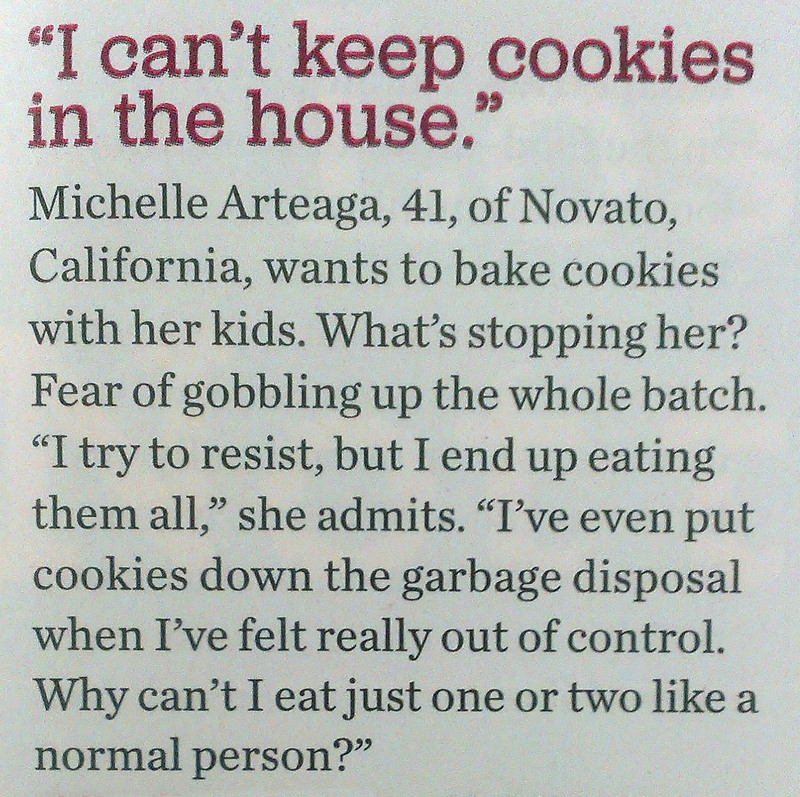 Probably for the same reason me finding 3 cookies to be "enough" made me teary. This is weighty stuff for some of us (no pun intended). Sounds like you get it too. You're not being weird, you are on a journey of self discovery and doing all you can to find your own "right" way. Enjoy Evelyn's book, I'm still reading it now and find it very interesting. So glad you found my blog and that it's helped you. Join my FB page too (link is in upper left column). Such a great post! Thank you for sharing, I only just found it now because I've recently in the last few months started Intuitive Eating. Thanks! Intuitive Eating is something I've had to incorporate very slowly. We each have to find our own path and for me, it's meant a very gradual movement toward IE. I wouldn't feel comfortable diving into it, or stepping off the scale for good, so I'm definitely using some of the approach, just not all. Thanks for stopping by!! Another thing that I would recommend is using a fitness journal to keep track and measure your progress. People tend to become more motivated when they start seeing the results and that their hard work is finally paying off.